February 27th is the first day of Eating Disorders Awareness week, which aims to make people aware of the impact that eating disorders can have on a person and what we can all do to support someone who is affected. The National Eating Disorders Association presents a number of ways you can also get involved on their website: http://nedawareness.org/. Anorexia nervosa – when an individual tries to keep their weight as low as possible. This condition affects 1 in 250 women and 1 in 2,000 men. Bulimia – when an individual tries to control their weight after binge eating by making themselves sick or using laxatives. This condition is two to three times more common than anorexia and 90% of those affected are women. Binge eating disorder – when an individual eats large amounts of food in a short period of time. This condition is estimated to affect around 5% of the population and it presents equally in both genders. Eating disorder, not otherwise specified – when an individual exhibits only some of the typical signs of an eating disorder. Eating disorders can potentially be triggered by several interacting factors, such as a person’s genetics, biology or environment, alongside their particular experiences, such as feeling depressed, being criticised, having relationship difficulties, etc. Thus, the cause differs among affected individuals. 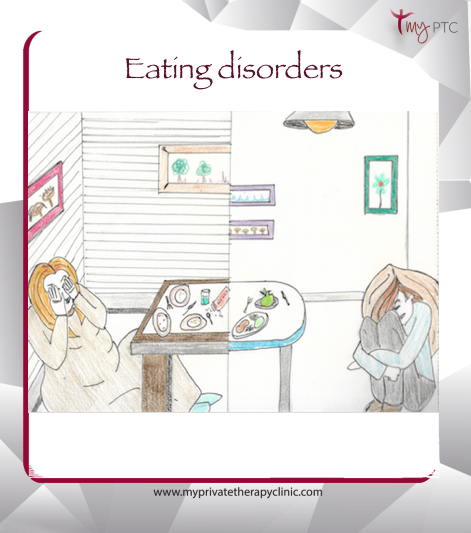 The way eating disorders affect different people can also vary greatly from one person to another. In my clinical practice, I have worked with all of the above types of eating disorders, and in each case I can’t help but notice how particularly devastating the disorders are for the individual affected. Here, I briefly present an example of a client I worked with (JT) to help him overcome his binge eating disorder. JT had been binging on sweets since adolescence. He was in his late twenties when he was finally able to recognise that there was something unusual about this behaviour. He knew he was unable to stop eating sweets, even if he has no sensation of hunger or desire to have them. He would hide from others when he wanted to binge and this would leave him feeling sad, guilty, and worried about his weight. After a few weeks of monitoring, we identified that this behaviour was more likely to occur when JT was misinterpreting physical sensations, such as feeling cold, tired or unwell, with hunger. It was also more likely when he was feeling alone, bored or stress. Thus, binging on sweets was serving as a temporary solution, a reward or distraction from unpleasant experiences. Once JT acknowledged this pattern, he was ready to implement a plan that we put together. This consisted of cognitive, relaxation, and mindfulness techniques, as well as alternative and healthier behaviour choices (e.g., wearing warmer clothes, having a bath, drinking tea, calling a friend, or playing the piano) that could counteract his automatic urges to binge. Over time, JT could better understand his physical needs and mental state, and managed gradually to replace his binging with other constructive behaviours. This made him feel in control again, because he could choose how he wished to respond to his needs. In return, this further consolidated his newly found confidence to deal with his condition. The food you consumed (or skipped). Finally, note the thoughts that were going through your mind afterwards. How did it make you feel and what did you do (e.g. did you try to self-induce vomiting, did you use any laxatives, did you over-exercise, or did you engage in any other risky behaviours, etc.)? Once you collect a few weeks’ data, go over them and try to identify any potential patterns that can help you to better understand your behaviour. Then, try to come up with alternative behaviours that could be more constructive, instead of over- or under eating. If you’re concerned about the results of your assessment, then it’s a good indication that it’s time to seek help. You do not have to go through this alone. Remember, there are various ways that the symptoms of eating disorders can affect you. With the passage of time, they can make you feel even worse and begin taking over important parts of your personal, social, and work life. But, remember that help is available and you can work out this out with the appropriate professional support.